The European Union increased its support for local and regional authorities in Ukraine on 8th of March, with the launch of five partnerships between Ukrainian and EU regions and cities. The relationships will see Estonian, German, Hungarian, Lithuanian and Polish communities share their experience in areas identified as priorities by their Ukrainian partners – drawing up economic-development plans, supporting rural areas, helping small and medium-sized enterprises, boosting tourism, and increasing transparency. The initiative is part of a broader effort by the European Committee of the Regions (CoR) to support the decentralisation of power in Ukraine, a process that began in April 2014 and that has seen a consolidation of local governments, an increase in their funding and the transfer of greater powers to them. The partnerships will see local officials and experts visit each other’s communities to identify objectives, analyse challenges, and implement plans over the course of the next three years or more. Four of the five EU communities involved have representatives in the European Committee of the Regions. Financial support comes from the European Commission, with GIZ, the German development agency, providing day-to-day technical support. The city of Rakvere in Estonia will work with Vesele in southern Ukraine on energy efficiency and sustainable local development, while the Wielkopolska region has teamed up with Kharkiv region in north-eastern Ukraine to assist rural development. Shyroke in the Dnipropetrovsk Oblast in eastern Ukraine will be teamed with Barleben from Saxony-Anhalt in Germany, while the western Ukrainian region of Khmelnytskyi has asked Szabolcs Szatmár Bereg County in Hungary to help develop green rural tourism. Zarasai municipality in Lithuania will share its experience of improving transparency and involving local citizens in decision-making processes with Chemerivtsi, a town in the foothills of the Carpathian mountains. 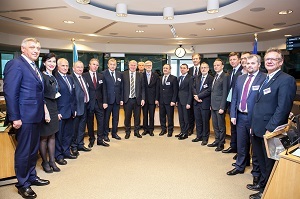 On the same day, representatives from the Ukrainian regions also attended a meeting in Brussels of the Ukraine task-force created by the CoR, at which the keynote speech was given by Vyacheslav Nehoda, Ukraine’s First Deputy Minister for Regional Development, Building and Housing. Other speakers included Marc Cools, Vice-President of the Congress of Local and Regional Authorities of the Council of Europe, Tibor Szanyi MEP, deputy chair of the EU-Ukraine Parliamentary Association Committee, and senior EU officials – including Peter Wagner, Head of the European Commission’s Support Group for Ukraine, and Dirk Schuebel, head of the Eastern Partnership division in the European External Action Service.